Stephen Rademaker is a lobbyist and lawyer who served as an assistant secretary of state in the George W. Bush administration. 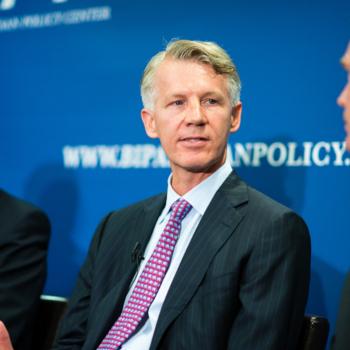 A veteran counselor for a host of government agencies, Rademaker is currently a principal at the Podesta Group lobbying firm and a project adviser at the Bipartisan Policy Center (BPC), a think tank that has staked out a decidedly hawkish position on Iran. He is the spouse of Danielle Pletka, the vice president of foreign and defense studies at the neoconservative American Enterprise Institute. Rademaker, a strong proponent of the 2003 invasion of Iraq, authored the Iraq Liberation Act of 1998, which was signed into law by then-President Clinton and formed the basis for Congress’ October 2002 authorization for the use of military force against Iraq. As a principal at the Podesta Group lobbying and public affairs firm, which counts the Iraqi government among its clients, Rademaker has financially profited from the war. According to the Intercept, the Podesta Group entered into a $1 million contract with the Iraqi government in 2013, which was renewed in 2014 for an additional $1 million, and which Rademaker may have earned upwards of 20 percent of depending on the degree of his involvement in helping secure the contracts. Rademaker, whose portfolio at the State Department included “international security and nonproliferation,” has frequently accused Iran of developing nuclear weapons and urged a militarized U.S. response. In January 2014, for example, shortly after Iran and six world powers reached an interim agreement on curbing and verifying Iran’s nuclear enrichment program, Rademaker penned an op-ed for The Hill claiming that “Iran could currently produce enough weapons grade uranium for a nuclear device in as little as five weeks” and suggested that Iran could cheat on its end of the agreement. That same month, he added his name to an open letter drafted by the neoconservative Foreign Policy Initiative—a successor group to the Project for the New American Century, which marshaled Beltway support for the Iraq war a decade before—calling on Congress to “pressure” Iran to keep its end of the agreement. The letter strongly implied support for sanctions legislation introduced by the hawkish Sens. Mark Kirk (R-IL) and Robert Menendez (D-NJ) and backed by the American Israel Public Affairs Committee (AIPAC). Journalist Jim Lobe described the package as a “Wag the Dog” bill that was designed by Iran hawks, following the lead of the right-wing Israeli government, to scuttle the talks by punishing Iran with new sanctions legislation even as it negotiated with Washington and its partners. Rademaker has contributed to several BPC reports calling on the United States to bolster its military presence in the Middle East in response to the Iranian nuclear enrichment program, which Rademaker and BPC have insisted—contrary to the estimation of the U.S. intelligence community—is geared towards producing a nuclear weapon. Along with other outspoken hawks like Michael Rubin, Michael Makovsky, and Dennis Ross, Rademaker helped draft a 2008 report calling on the next U.S. president to issue Iran an ultimatum to suspend its nuclear enrichment by a certain time, after which the United States would “have to target not only Iran’s nuclear infrastructure, but also its conventional military infrastructure in order to suppress an Iranian response.” Jim Lobe lampooned the 2008 report as a “roadmap to war” that was transparently designed to force a confrontation over the nuclear issue. Despite his preoccupation with nonproliferation in Iran, as assistant secretary of state Rademaker played a key role in the Bush administration’s negotiation of a 2005 nuclear agreement with India. In the deal, the United States agreed to transfer nuclear energy technology to India, which developed a nuclear weapon in the 1990s. The year after the agreement was concluded, Rademaker left the State Department to take “a lucrative lobbying job” at the same firm the Indian government had hired to push for the deal. The deal was controversial. By offering India nuclear technology without pressuring it to disarm, an analyst for the Center for American Progress argued, it “abandoned the one incentive states have to stay in the [Nonproliferation Treaty], without providing an alternative framework to sustain the effort to control proliferation.” The administration, however, may have had other motives. 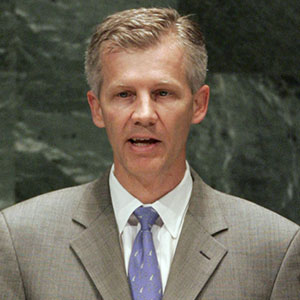 In 2007, Rademaker made headlines in India by suggesting that, for its end of the deal, India had been “coerced” into voting against Iran at the International Atomic Energy Agency, a claim the U.S. government subsequently denied. Rademaker’s BPC bio boasts that he has worked “in all three branches of government.” In Congress, he worked in the office of Majority Leader Bill Frist (R-TN), served as counsel to the House select committee that led to the creation of the Department of Homeland Security, and held several posts on the House Committee on International Relations. In addition to his State Department work, Rademaker also offered legal counsel to several executive agencies, including the Peace Corps, the National Security Council, the George H.W. Bush White House, and the U.S. International Trade Commission. For one year in the 1980s, he clerked for a federal D.C. circuit judge. Ken Silverstein, “How the Iraq War Financed a Beltway Real Estate Boom,” The Intercept, January 2, 2015, https://firstlook.org/theintercept/2015/01/02/war-iraq-helped-finance-personal-beltway-financial-boom/. Stephen Rademaker, “On Ukraine, President Obama should be more like Jimmy Carter,” The Washington Post, October 8, 2014,http://www.washingtonpost.com/posteverything/wp/2014/10/08/on-ukraine-president-obama-should-be-more-like-jimmy-carter/. Blaise Misztal and Stephen Rademaker, “After deal with Iran, fund and verify,” The Hill, January 28, 2014, http://thehill.com/blogs/congress-blog/foreign-policy/196537-after-deal-with-iran-fund-and-verify#ixzz2saDJQLNK. Jim Lobe, “Neocons Who Brought You The Iraq War Endorse AIPAC’s Iran Bill,” LobeLog, January 9, 2014, https://rightweb.irc-online.org/articles/display/neocons_who_brought_you_the_iraq_war_endorse_aipacs_iran_bill. Stephen Rademaker, “Addressing the Iranian Nuclear Challenge: Understanding the Military Options,” Testimony to House Armed Services Committee, June 20, 2012, http://www.iranwatch.org/sites/default/files/us-hasc-rademaker-prepared-062012.pdf. Amanda Terkel, “After Negotiating India Nuclear Deal, State Dept. Official Gets Lucrative Job Lobbying For India,” Think Progress, January 12, 2007,http://thinkprogress.org/politics/2007/01/12/9609/lobbying-india-nuclear/. Indrani Bagchi, “India Coerced into Voting against Iran,” Times of India, February 17, 2007, http://articles.timesofindia.indiatimes.com/2007-02-17/india/27878323_1_iran-issue-iaea-india-account. Bipartisan Policy Center, Stephen Rademaker bio, http://bipartisanpolicy.org/about/staff/stephen-g-rademaker.